Actress Mayim Bialik, a key cast member of the popular sitcom The Big Bang Theory, is getting ready for Chanukah by making latkes at home, and she posted a video of the process for her fans to share. 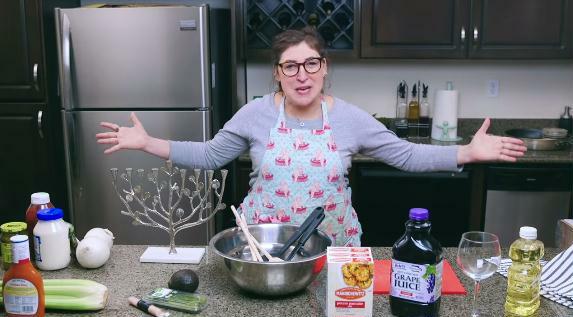 We light the first Hanukkah candle tonight, and if you haven't already grated your potatoes, Mayim shows a shortcut -- out of the box latkes (The Manischewitz box, that is). After making the traditional ones, she offers Millennials something more daring -- Avocado toast latkes and Buffalo latkes. Enjoy, and have a happy Hanukkah! A Joke to Start the Week - "Gorilla on the Bus"
A Joke to Start the Week - "A Loud Prayer"